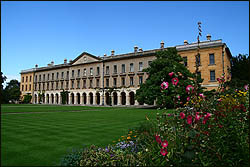 Most people come to Oxford to see the colleges and great halls. There are quite a few (38 colleges and 6 permanent private halls). No two are alike. Even a veteran would probably have not seen all the colleges. It is probably wise to stick to just a few. For some big ones, try Christ Church (St Aldate's), Magdalen College (High Street), New College (New College Lane or Holywell Street (winter)) and for some mid-sized ones try Hertford College (Catte Street), Lincoln College (Turl Street), Exeter College (Turl Street). Don't miss the other major landmarks - Radcliffe Camera, St Mary's Church (both at Radcliffe Square), Carfax Tower (corner of Queen Street and Cornmarket Street), The Saxon tower of St Michael at the North Gate - Oxford's oldest building almost a thousand years old (corner of Ship Street and Cornmarket Street) and Martyrs' memorial at St Gile's - a memorial for the three Archbishops who were tried and burnt at stake in Oxford almost 500 years ago. The Ashmolean Museum (Beaumont Street) and the Museum of Natural History and Pitt River's Museum (Parks Road) are among the finest museums in the country. A punt is flat bottomed boat propelled by pushing a long pole against the river bottom. Punting requires a bit of skill and practice. However the absence of either should not stop one from trying this quintessential Oxford river activity. 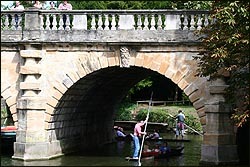 Punts can be hired from either Magdalen Bridge (east end of High Street) of the Cherwell Boathouse. Punting from Magdalen Bridge will take you past St Hilda's college, Botanic Garden, Christ Church Meadow and finally to River Isis (River Thames in Oxford). If are a bit more adventurous, you could punt from the Cherwell boathouse on River Cherwell to the Victoria Arms for a nice break. The river is a bit more wider and gives you a feel of going through a forest. Oxford and Cambridge have a different take on how a punt must be steered. While at Cambridge this is done from the flat region at the end of the punt called "till", "box" or "deck", here at Oxford this is done from the dugout region. Drinking is a favourite pass-time around here. 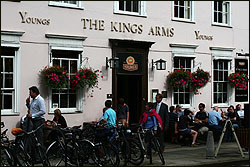 If you are tired of the sights of Oxford pop into a few of Oxford's famous watering holes. There are quite a few historic pubs in and around Oxford. Oxford is a walkable city. In fact to really explore the city one must see it on foot since large parts have restricted access to vehicles. However, there are numerous tours on offer. The red open bus "City Sightseeing Tour" is quite popular, with numerous pick-up and drop-off points in town, including the train station, coach station and Broad street. 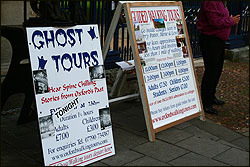 Walking tours and ghost tours lasting 1-1.5 hours start from Broad Street outside the tourist information centre or in from of Trinity College gates (Broad Street). Irrespective of what you wish to buy, there are lots on offer. 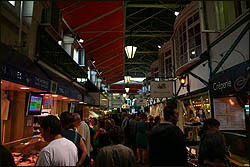 Most of these are along Broad Street, Cornmarket Street and High Street. Souvernir shops line High Street and Broad Street. Books shops are found mainly on Broad Street. Clothes retailers are on High Street, Cornmarket Street and Queen Street. You could also skate at the Ice Rink or go karting.